Blood glucose management is an important aspect of a healthy diabetes diet. Following a healthy diet plan can help stabilize your blood glucose levels and keep them within a healthy range. The American Diabetes Association praises the health benefits of nuts, calling them a diabetes superfood. You can healthfully incorporate pistachios in your diabetes diet. Consuming foods that contain carbohydrate will cause your blood glucose levels to rise. Foods that contain carbohydrates include fruits, vegetables, beans, lentils, grains, milk and nuts. Carbohydrates include three main types: sugar, starch and fiber. Sugar and starch carbohydrates cause an increase in your blood glucose levels. Fiber, unlike sugar and starch, does not raise your blood glucose levels. High-fiber foods make excellent choices on a diabetes diet. Pistachios and other nuts – as well as fruits and vegetables with edible seeds and skins, beans, legumes and whole grains – are contain substantial amounts of fiber. A 1-oz. serving of raw pistachio nuts contains approximately 159 calories and 5.75 g of protein. One ounce of pistachios also contains about 5.54 g of total carbohydrate. Here is the carbohydrate breakdown: Out of the 5.54 g of total carbohydrate, 2.17 g is from naturally-occurring sugars, 0.47 g is from starch and 2.9 g is from fiber. After you eat pistachio nuts, the food debris travels to your stomach in order to undergo the process of digestion. 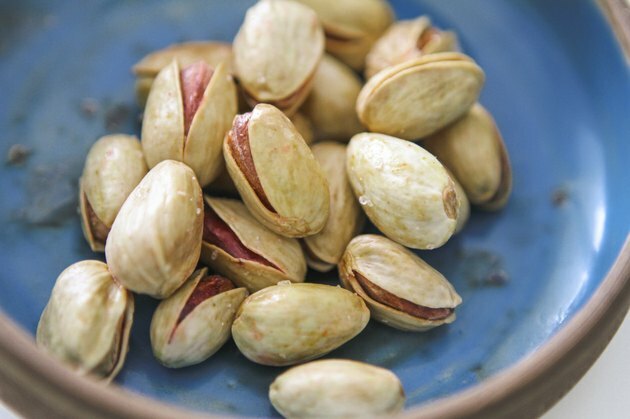 Once in your stomach, the pistachios begin to break down. The sugar carbohydrates pass through the lining of your stomach and enter your bloodstream. The starch carbohydrates get broken down and converted into sugar molecules, so that they too can go through the lining of your stomach and get absorbed into your bloodstream. Instead of entering your bloodstream, the fiber carbohydrates continue to make their way out of your body until they are passed. Because a 1-oz. serving size of pistachios contains so few carbohydrates, it is unlikely that eating them will cause a potentially unsafe rise in your blood glucose levels. According to the American Diabetes Association, you should consume between 45 g and 60 g of total carbohydrate per meal. With only 5.54 g of total carbohydrate per serving, there is plenty of room to incorporate pistachios into your meals, without exceeding your carbohydrate intake recommendations. Try sprinkling 1 oz. of unsalted pistachios on top of a green leafy salad. Or try preparing oatmeal with whole rolled oats and adding fresh banana and pistachios. Another option is to make a fruit smoothie with 1 cup of non-fat milk, 1/2 cup of fruit, and 1 oz. of finely chopped pistachios. Can Salted Peanuts Make My Blood Sugar Rise?